Corbenic Camphill community were delighted to welcome Mark Ruskell MSP to their community last week. 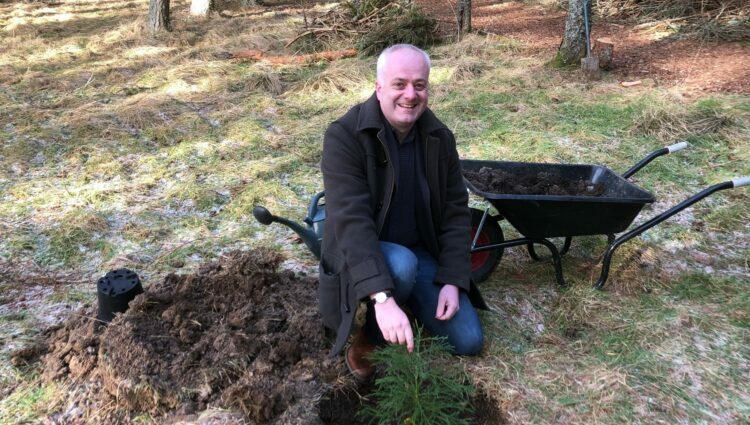 During his visit, Mark was able to meet with residents, volunteers and workers before planting a redwood tree beside the popular Corbenic Poetry Path which takes visitors around the community. Members of Corbenic Camphill community highlighted how Brexit uncertainty is affecting recruitment in social care, and volunteers from the EU shared their concerns about their immigration status post-Brexit. Camphill Corbenic is a wonderful, creative, peaceful place that offers an incredibly supportive environment for long term residents with special needs. The Corbenic shop in Dunkeld has also become a strong part of the town offering a really important workplace for residents. The Camphill movement has attracted young people to Scotland for decades to work and learn in these communities, but it’s clear that Brexit is driving many to question whether they will have any long term security if they volunteer in Scotland and then choose to stay for longer. We cannot under-estimate the impact Brexit is having across all sectors, Westminster government must end the uncertainty especially for those who work in social care. We warmly welcome Mark Ruskell MSP’s visit to Corbenic. It was a great opportunity for Mark to find out firsthand about Corbenic’s approach to care and support for people with learning disabilities and other support needs, and to find out more about the potential impact of Brexit upon the community and our workforce. Mark’s support is much appreciated.